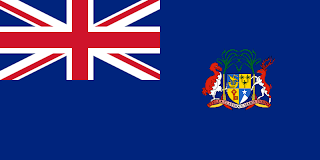 Mauritius had been part of the Dutch empire, until they abandoned it, then the French empire. Then, during the Napoleonic wars, Britain captured the island, and kept it until independence. Independence was achieved on 12 March, 1968, with the new flag being registered with the Royal College of Arms in London the January before. 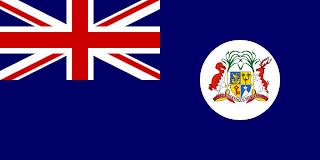 During Mauritius time under British control, they used the standard blue ensign. Charged with the state coat of arms in the fly. The first ensign placed the coat of arms on a white disc. Then, from 1923 to independence, the white disc was removed. 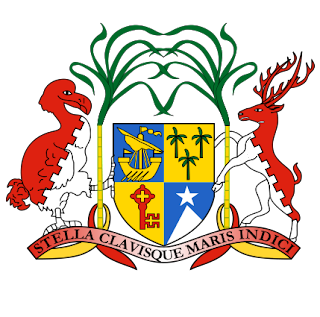 The coat of arms themselves where kept by Mauritius post-independence, and are notable as one of the supporters is the Dodo. Mauritius is the only known place in the world to have been home to the animal First discovered around 1600, and extinct 80 years later! The new flag for Mauritius is a horizontal quad colour flag. 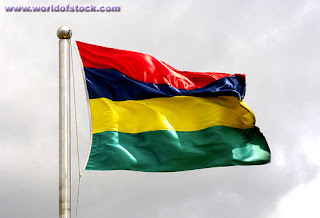 The top, red stripe stands for the struggle for independence, the next blue line stands for the Indian Ocean, when Mauritius is located, then the yellow line stands for the light of independence, and the green stands for the lush vegetation of the island.